I hope by now you all now what a Quick Response (long version for QR) code is. If not, or if you want to see if there is something about QR codes you don’t know, Wikipedia as quite some good details on that. You can also point your browser to the inventor of the QR code Denso Wave. 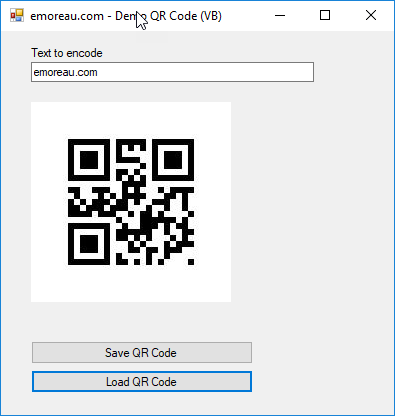 This article will show you how to encode (create) a QR code as well as to decode (consume) one from a .Net application. This month’s downloadable demo solution contains both VB and C# projects. The solution was created using Visual Studio 2017 but should also work in most older versions as well. The projects of this solution will use the free ZXing.Net library. 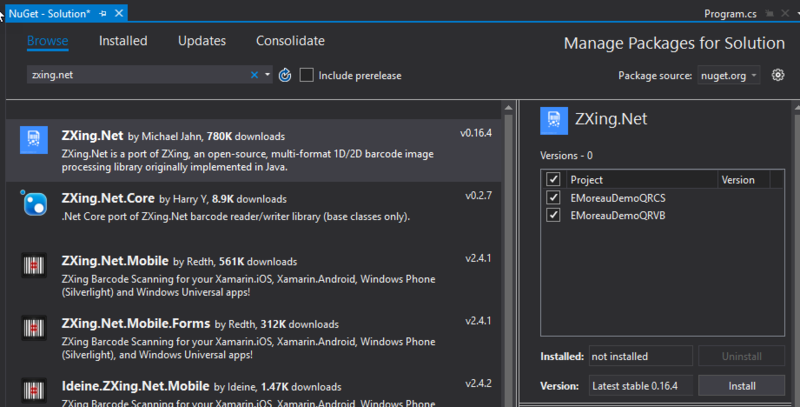 As per the library NuGet page, the library is compatible with everything .Net even including SilverLight and Windows Phone if you still have interest in those platforms! For the demo purpose, I am just creating here a very simple solution containing both VB and C# Windows Forms project. Nothing fancy, as usual. A textbox (txtInput) to let you enter a value. A PictureBox (picResult) to display the generated QR Code (or the image loaded from the Load button). The easiest way to add the required library to your project is to use the NuGet package. Just search for ZXing.Net by Michael Jahn. Notice that it has 780K downloads, not bad! Before I forget, it is worth mentioning that this library does not only create/consume QR codes but also many different kinds of barcodes (if you need them). For the demo, I will do something really simple. I will let you enter some text in the textbox control and I will use the library to generate the QR code on the fly because it is so quick. You will be able to see the resulting image in a PictureBox. It ensures that there is some text to encode (otherwise an exception is thrown). It creates some encoding options to specify the width and the height of the QR code to generate. It creates an instance of a BarcodeWriter object specifying to create a QR_Code format and passing the options. It finally calls the Write method of the object and sends the resulting image to the PictureBox control. And because you might want to save the generated QR code as a file (to later test the decoding! ), I have added a save button to my test form. I use the Save method of the PictureBox control to save the image to the current folder. This library is not only good at creating a QR code for some text you want, it can also decode an image containing a QR code back to text. You can even try to foul the library by passing an image that is not QR Code (or any recognized barcode), the Decode method just return a null value. QR codes are the new barcodes. But a lot better. And now that our phones directly support them, it just become something everybody get accustomed to. QR codes are everywhere and now maybe even more now that you also know how easy they be created (and consumed).